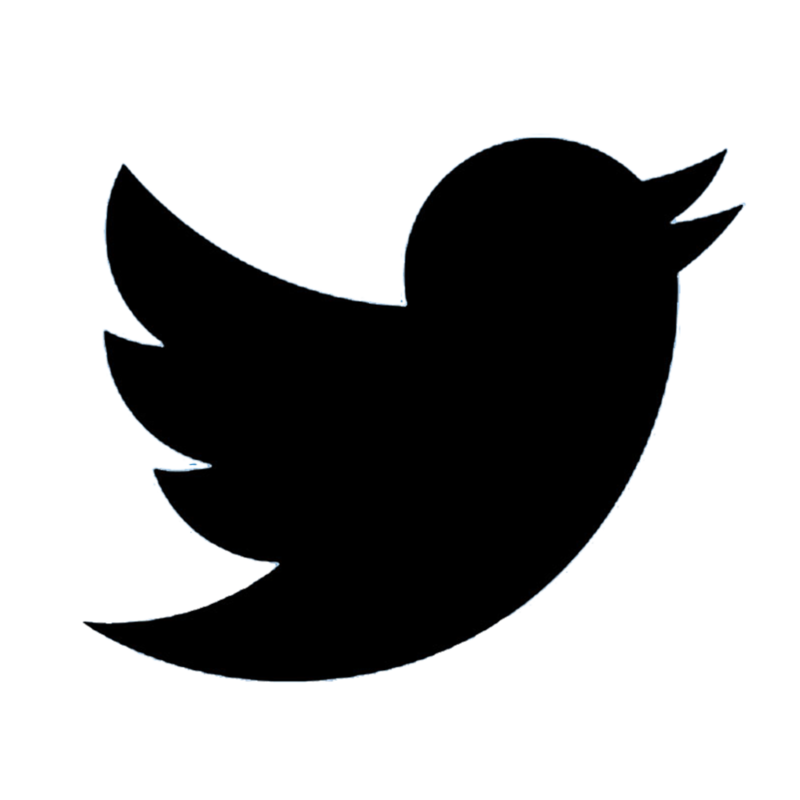 ADI is a pool contractor and pool designer that specializes in high-end, in-ground home pools that are the perfect addition to any backyard. 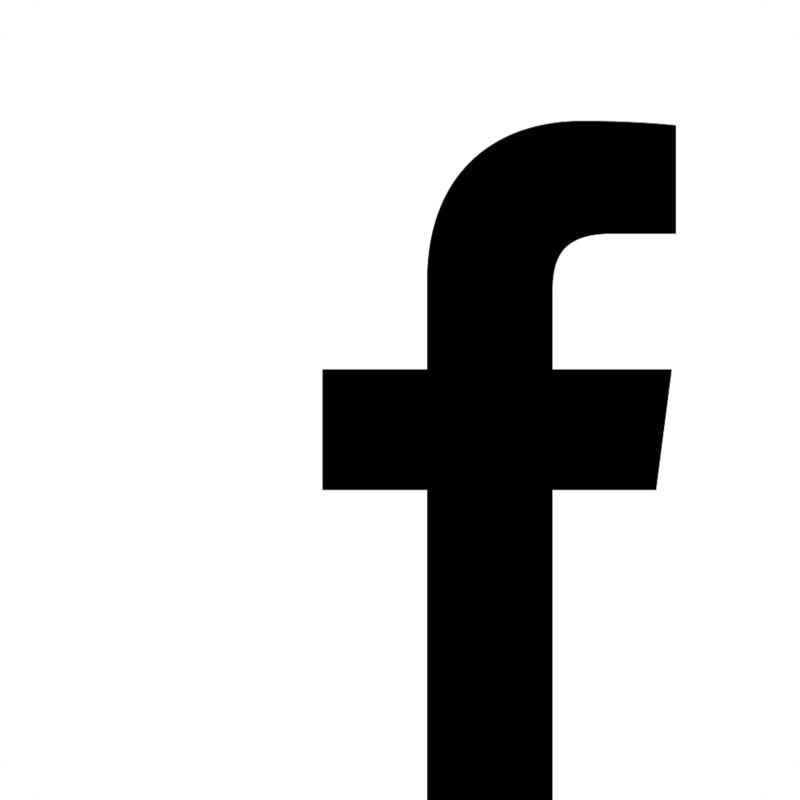 We provide long lasting swimming pools in the size, shape, and design of your dreams! We create dancing waters that are pleasing to the eye and promote physical fitness too! Let us enhance your natural environment with a residential swimming pool, spa, waterfall or fountain that will increase your home value and accent your natural surroundings. 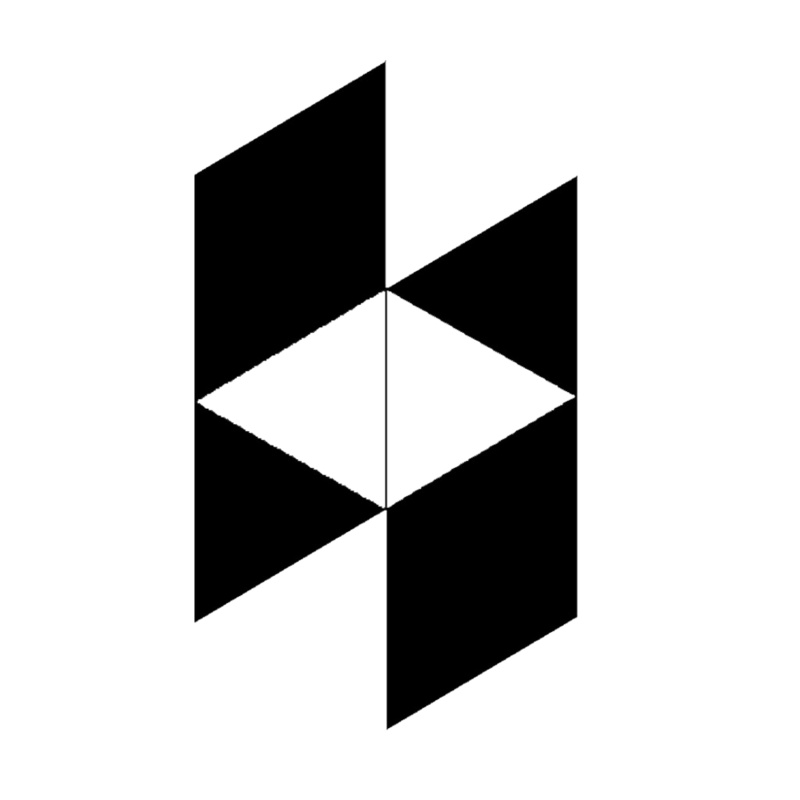 The features we can provide are versatile and sure to meet your needs for appearance, safety, maintenance and usefulness. 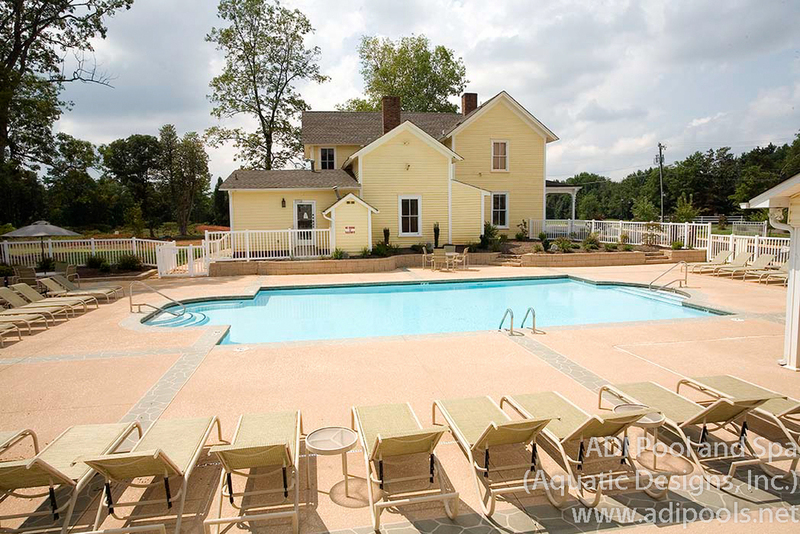 ADI designed and built this community swimming pool in Chapel Hill, NC. The pool features a shallow play area for small kids with an umbrella water feature, and a water cannon for interactive water play. The deck is broom finish concrete. 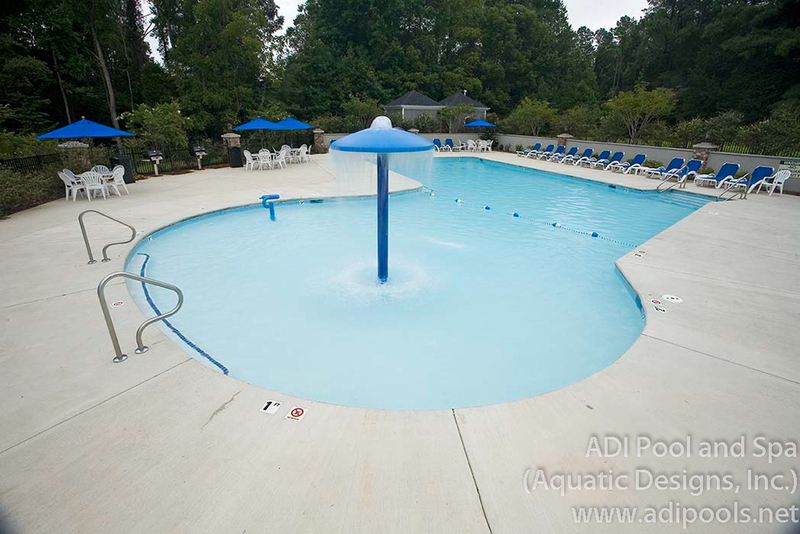 Call ADI for all your pool construction needs in Chapel Hill, NC. 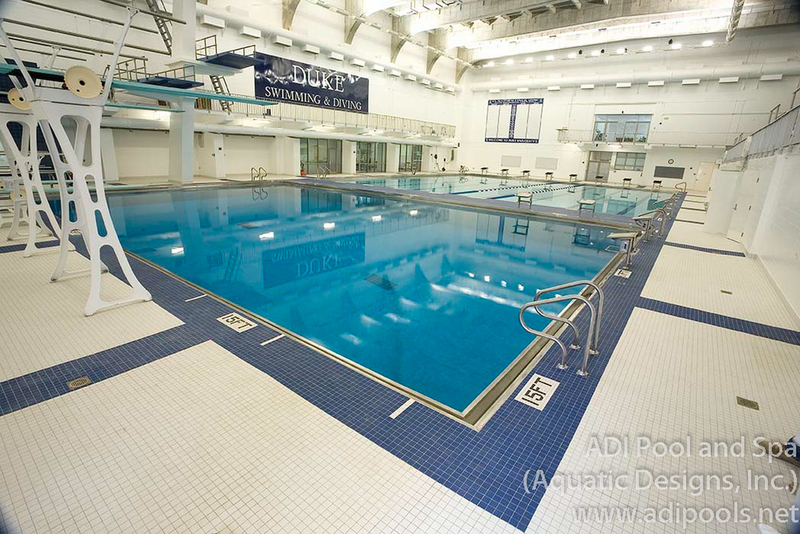 ADI Pool and Spa (Aquatic Designs, Inc.) was the pool contractor called in when Duke University in Durham, NC wanted to update their natatorium. First removing the existing gutter and working with gutter manufacturers to design and build a custom stainless steel gutter to accommodate the existing conditions. We then removed all finishes throughout the pool and replaced all the tile and plaster in both the 25 meter training pool and the 15 foot deep diving pool with 1 meter, 3 meter, and 10 meter dive stands. We then moved on to refurbish or replace all of the existing deck and deck equipment. Lastly we demolished the entire equipment room and replaced the antiquated pool filtration with up to date high rate sand filters, chemical controllers with automatic backwash control, automatic water level controllers, and UV light sanitation. 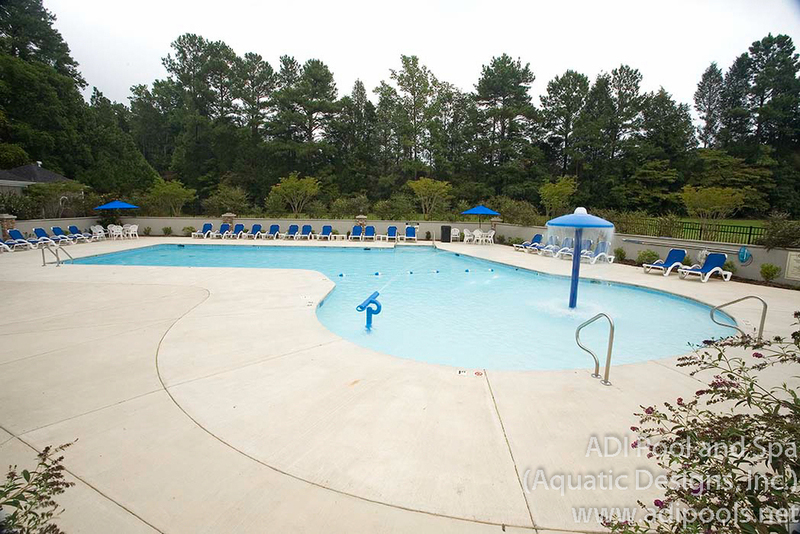 Give us a call for all your pool construction needs in and around Durham, NC. 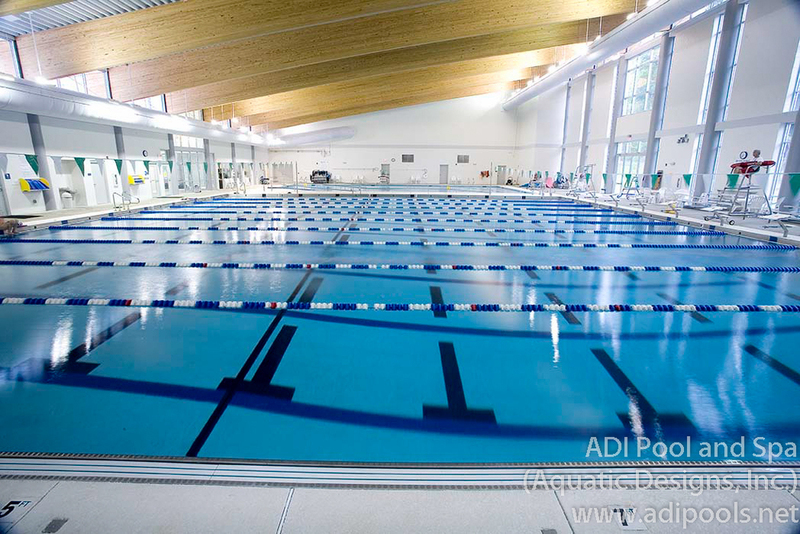 This community pool built by ADI in Greensboro, NC has a combination stamped and knockdown deck topping, a high efficiency heater for an extended season and underwater lighting. 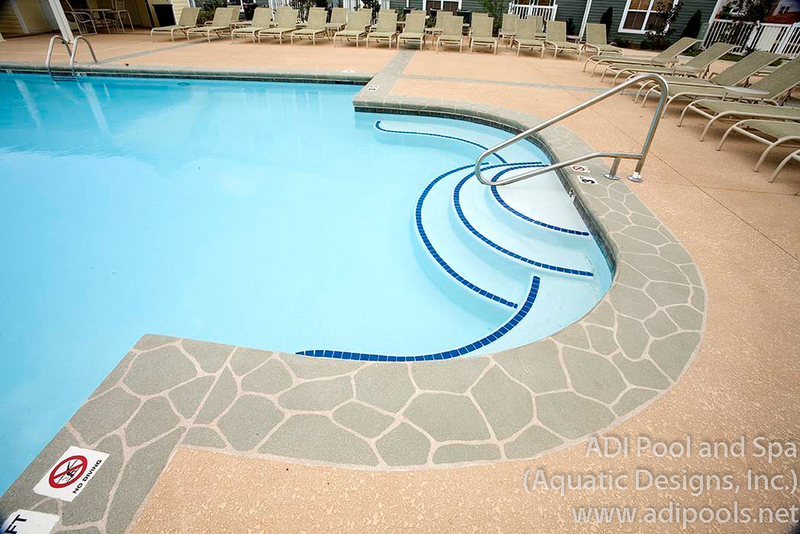 Call ADI if you are looking fora pool contractor in Greensboro, NC. 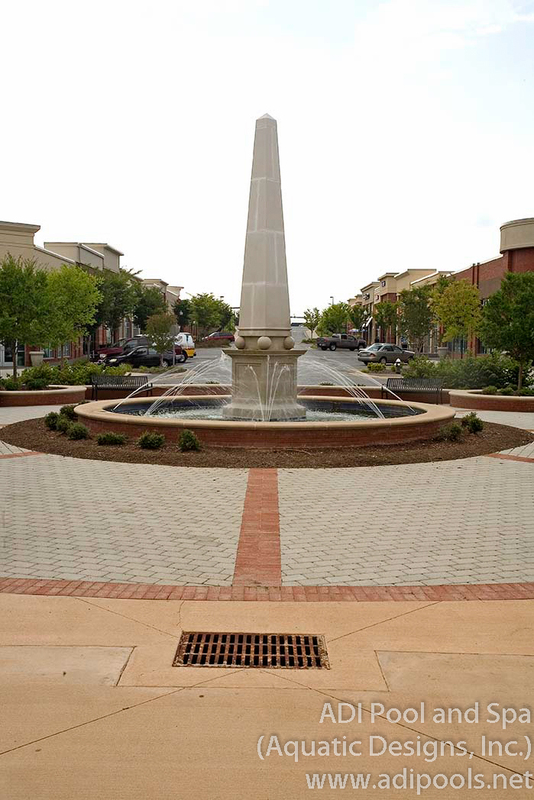 This simple fountain built by ADI in Greensboro, NC is at the entrance of the key risk building. Complete with automatic timers on both the features and lights the fountain has been in place and working great for over a decade with minimal maintenance. 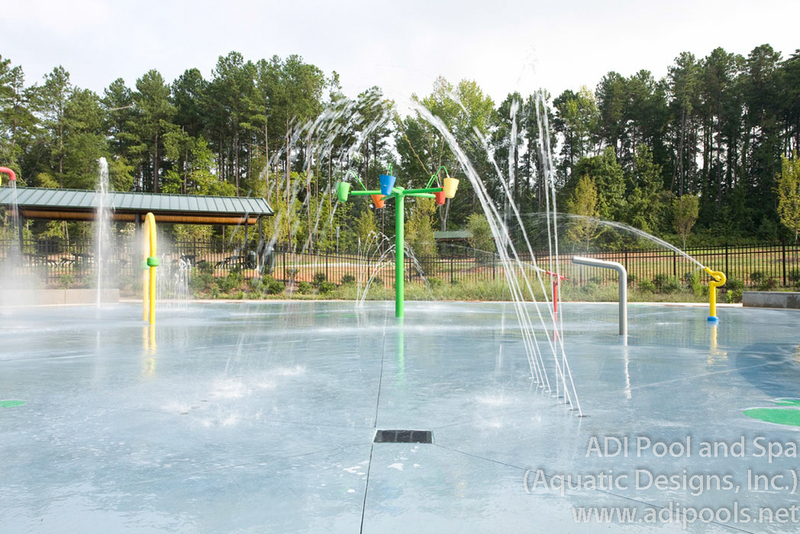 Call ADI for your fountain contractor needs around Greensboro, NC. 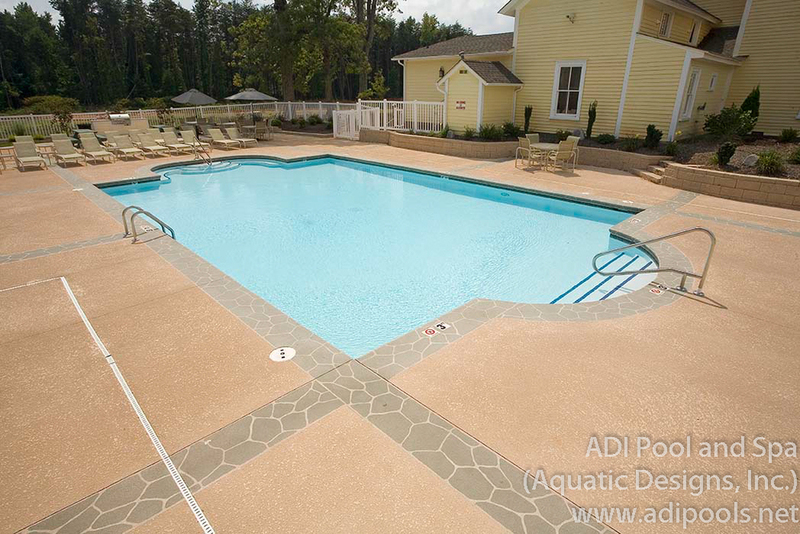 ADI acted as both the pool contractor and pool designer for this therapy pool and spa in Burlington, NC. 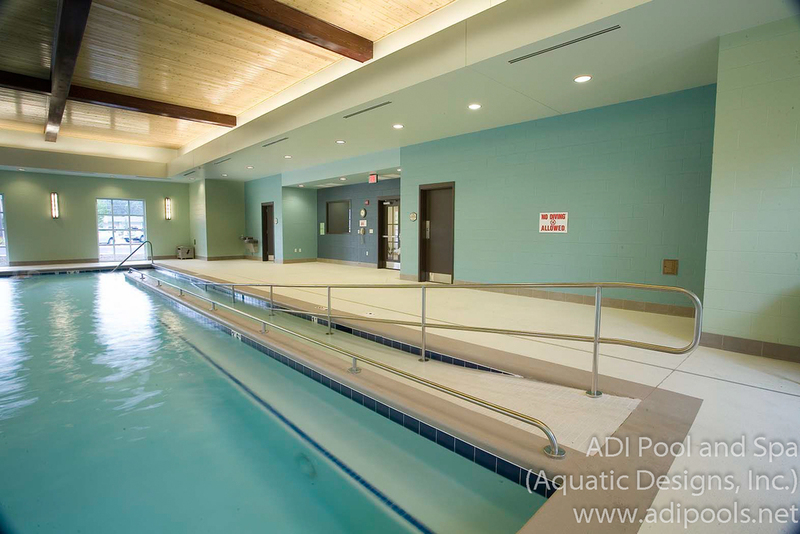 This pool designed exclusively for use by elderly and disable patients includes a pool access ramp, a water exercise area, and lap lanes for exercise. The facility also has a hydrotherapy spa kept at an even 102 degrees. Both bodies of water are treated by a salt generator for optimum bather comfort. The pool deck is done in a colored knockdown deck coating to keep the surface at a cool temperature even when the sun is streaming in the windows. 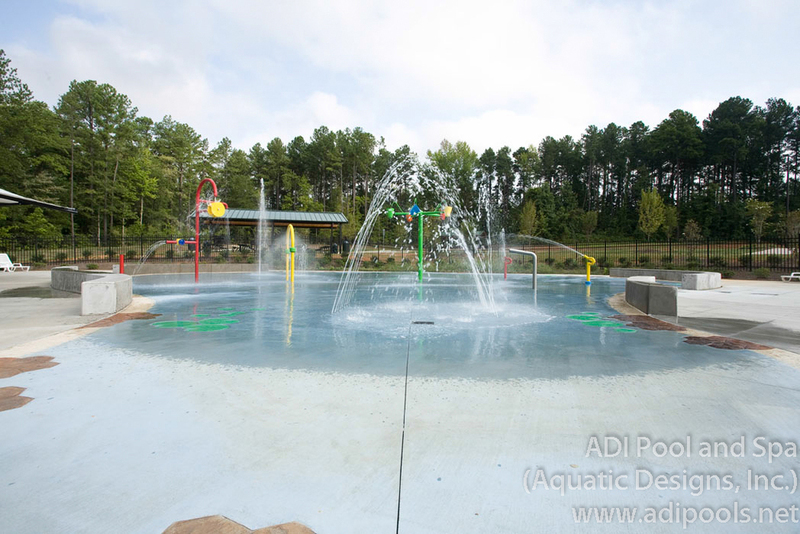 ADI designed and built this splash pad for the City of Greensboro at Barber Park. The splash pad features multiple above-ground and below-ground features placed on a colored concrete deck themed to simulate a blue pond with lily pads and a sand border. 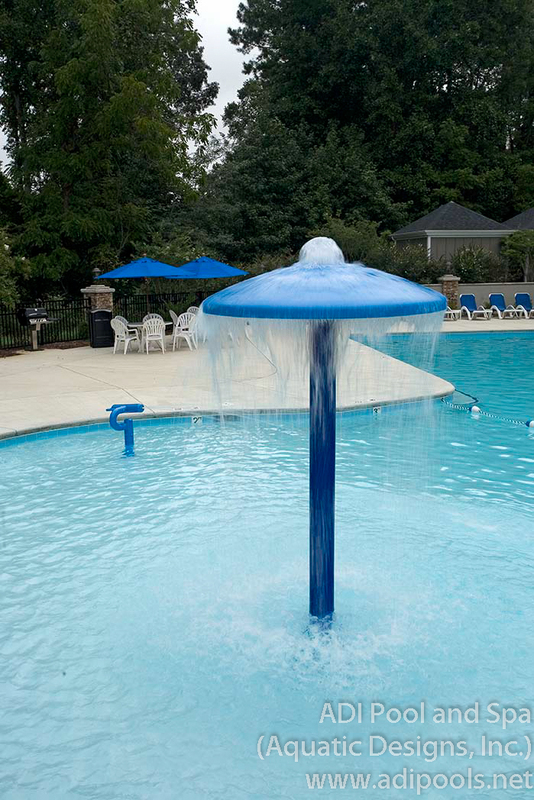 The splash pad features an activator allowing the kids to turn on the features, and interactive features allowing the kids to fire water cannons at each other, adjust the volume of water through a spray nozzle and even change the flow direction on a feature. 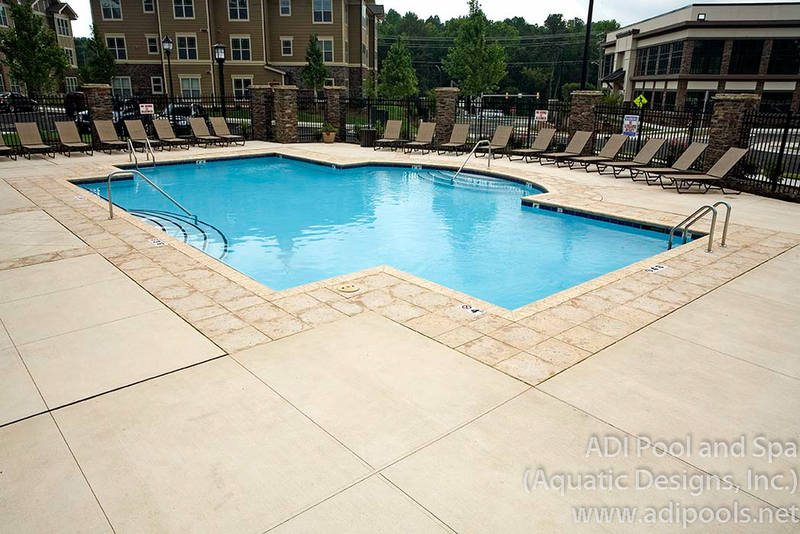 This community pool designed and built by ADI in Chapel Hill, NC features stone coping, a stone paver border around the pool, broom finish scored concrete deck, sand filtration, and energy efficient pumps. 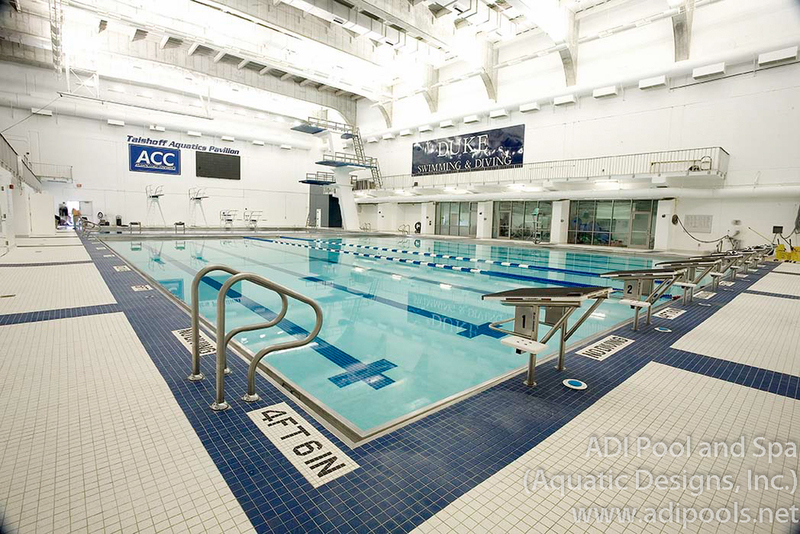 ADI was selected as the pool contractor for this facility in Orange County, NC. This pool complex features a 25 yard by 25 meter competition pool with stainless steel gutters, and a warm water therapy pool with an extra large ramp access area. Energy efficient pool pumps with variable frequency drives, UV light sanitation, chemical controllers and high rate sand filters keep the pool water crystal clear no matter the bather load. 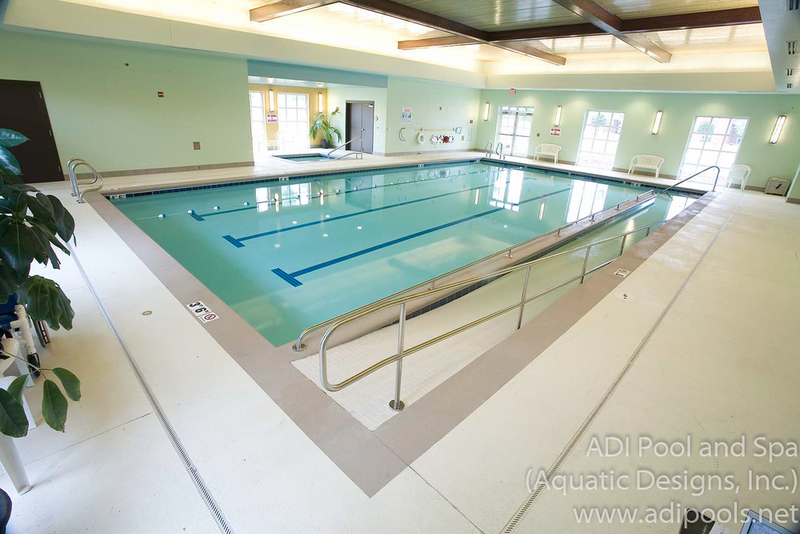 This county project in Chapel Hill, NC is a great example of the quality of work ADI provides.